Acrylic on wood panel, 42 x 36 inches. 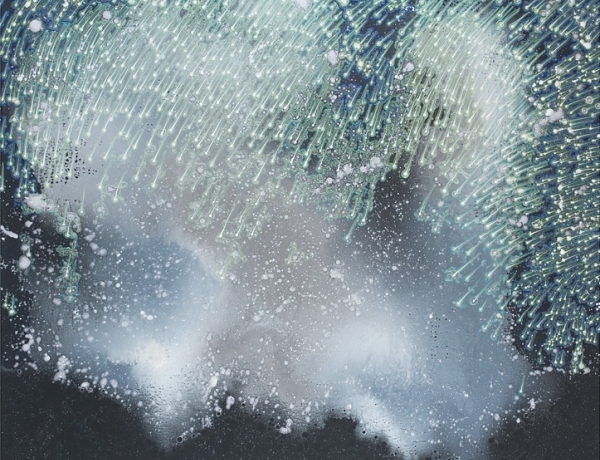 DC Moore Gallery is proud to present Waiting in the Sky, an exhibition of new work by Barbara Takenaga. This is the artist’s fourth solo exhibition at the gallery. The exhibition will comprise a series of large-scale paintings, on linen and panel, and a wall-piece related to her current installation at MASS MoCA. The exhibition is accompanied by a fully illustrated catalog with an essay written by American poet and critic John Yau. 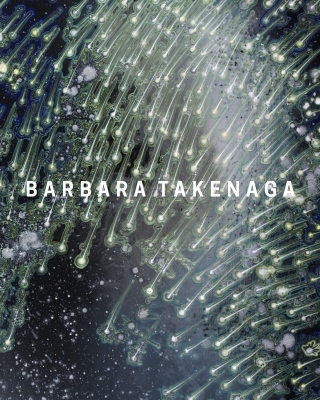 Barbara Takenaga’s new body of work continues the artist’s eloquent inquiry into the emotional weight of imagined spaces and natural phenomena. Each carefully constructed composition questions the boundaries of the known by offering visual translations of the ever-changing nature of the physical world. Through the artist’s process of random background pours of paint and an ordered, labor-intensive approach, she constructs funnels, geodes, maps, and webs with her signature vocabulary of dots and splashes, outlined and traced in vivid shimmery hues of acrylic. Once fully realized, Takenaga’s compositions present portals or aerial views from places hovering above earth where an elastic reality pervades and parallel worlds could be the norm rather than the exception. Many of the painting titles, Amber, Floater, Twister or Aura/Arch present a duality of meaning and like the images themselves - land, city, and outer space - shape-shift, fluctuating between the positive and negative, the microscopic and infinite. The power of these paintings lies in their ambiguity, and is where Takenaga stakes out her own unique territory, nimbly making reference to familiar objects and spaces while simultaneously placing our sense of those things in question. Barbara Takenaga’s installation Nebraska is currently on view at MASS MoCA in North Adams, MA. Her work is in numerous public and private collections. Takenaga is a Professor of Art at Williams College. She lives and works in New York City. Friday, April 29 at 6:30pm. Reception to follow. Please join us at DC Moore Gallery for a gallery talk featuring artcritical Editor David Cohen in conversation with artists Katherine Bradford and Barbara Takenaga.